Where can you enjoy Malaysia's signature food by a waterfall rain or shine? You need not be out in the open. I had that experience indoor in Kuala Lumpur. 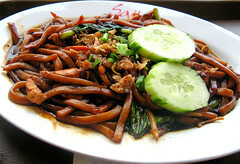 .... while savouring my Hokkien Char. 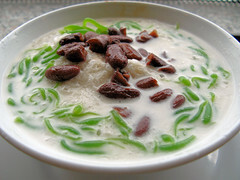 .... and Famous Penang Cendol. .... in a food court. 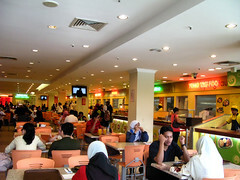 On first look, the food court resembles a typical one in Singapore. 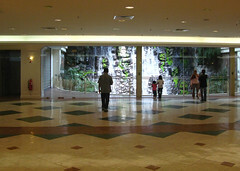 However there is a waterfall by the side which I have not seen in local food courts yet. 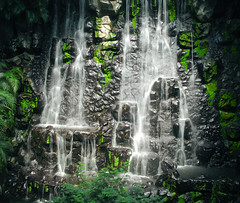 The waterfall is tucked away at one corner, so for most people the dry noodle stays dry. I went up one level and was delighted to find a viewing gallery for the waterfall. There is also ample open space behind for activities. At the end of the viewing gallery are child-care facilities. 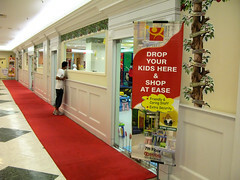 Parents can drop their kids in there and shop at ease. The package is comprehensive and they have courses like grooming, character building and public speaking. Due to the exchange rate, food in KL is pretty much affordable. 5.90 ringgit for the Hokkien Char and 2.50 ringgit for the Cendol. 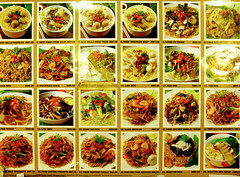 There is also much variety - like the noodles in the menu above - and in the spelling. I see 'Hockkien' and 'Cendol' whereas in Singapore 'Hokkien' and 'Chendol' are more commonly used. If you look at the stall menu, there are more. 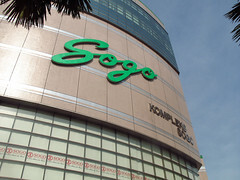 The food court and waterfall are on 6th floor of KL Sogo - Kompleks Pernas Sogo - located at Jalan Tuanku Abdul Rahman. 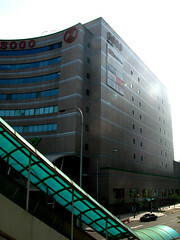 Bandaraya LRT Station exits beside the building. you shd try their bak kut teh ... very nice. I think I only tried their bak kut teh at Johor .. Taman Sentosa I think. icemoon, just across the fence from the ciq is a very popular gu bak hoon (beef noodle) stall. the braised duck in the same shop is also popular. peter chan and i ate there last thursday. we had actually driven into jb to look for his 'sweetheart' - mechinta. when you exit the ciq, head for stulang laut (remember, the place where mat selamat was supposed to have landed) and turn right towards the lorry checkpoint. the coffee shop is along jalan lumba kuda. we were looking for the sites of the former cathay cinema and hotel malaya. I have to believe Mas salamat did swim across the causeway after studying 2 jetties; one on malaysian side and the other on Singapore side (former KD Malaya). These 2 jetties reduce the distance by 1/2, so Mas probably needed to swim with a float (and picked up on the malaysian side by a boat) for a distance of 200 meters. Any recommendations for satay celop YG? Mouth-watering stuff here. Have you tried the Penang cendol sold in a lane near the market in Georgetown? The two stalls attract endless streams of customers. Thanks for the info. peter, satay celup. we go to melaka one day to eat.